At last I can stop feeling embarrassed. Thousands of us guilty of ‘old clothes crime’ up and down the country just got the old is the new black passport back to respectability. It’s not that I’m a walking fashion disaster (friends may disagree), it’s just that there are some things tucked away in my wardrobe that are quite prehistoric by anyone’s standards. 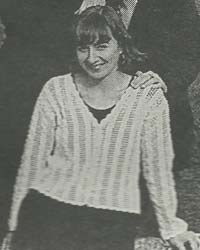 Now, thanks to loveyourclothes.org.uk, the new campaign from WRAP, it will be possible to flaunt and be proud of numerous workhorse skirts, swirly summer dresses and a favourite crocheted cardigan (pictured and which 20 years later, is still refusing to wear out). The Love Your Clothes campaign website is full of some great tips and ideas on how to make your clothes last longer by adapting, altering or transforming them so that they can have a whole new lease of life. There’s also advice on how to reduce the environmental impact of washing clothes and how to best dispose of those items that really have reached the end of the road. Love Your Clothes isn’t just about feeling better about these textile treasures we love to hang onto, it’s also about reminding ourselves perhaps just how much value is in what we already own. Research behind the campaign says that as a nation we have £30billion worth of clothes in our wardrobe which hasn’t been worn in the last year. Now maybe that is something to be embarrassed about!